Eric is about to hit the stage for the first time since 2011 and what better way to describe his thoughts about the experience than a deep conservation with his colleagues and friends. 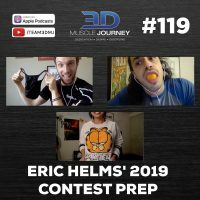 In this episode, Eric, Andrea, and Alberto discuss many different aspects of Eric’s 2019 contest prep. Topics covered include: Eric’s motives for competing, what his prep has looked like so far, Alberto’s role in Eric’s prep, Eric’s current and future nutritional strategies, and many more. Along with thoroughly examining Eric’s prep, the group spends a large portion of the episode talking about autoregulated dieting, the benefits of this approach, and the cost of rigidly adhering to specific macros. Helms talks about doing multiple full body sessions in a week. I’m curious on how you guys suggest structuring this type of training. Its suggested in the new pyramid book but no rough templates are outlined. Great question, Patrick! As a book purchaser, you might want to check out the Feedback/Support page on the pyramid books website specifically for reader inquiries. Check the following link to see if your question has already been answered, and if not, Eric & Andy visit the page weekly to reply.